Return of the Tracker! The Super Crayboth invaded again with 6 of his little buddies. Panel lines are back for this wave too! Click here to see the October 26 2014 Onell Design drop menu. Over 4 hours after launch, and the sell-outs are Super Skeleboth Pod Leader (which I am regretting not having ordered) as well as Skeleboth and Traker Sarvos. It is a beautiful batch of figures! Click here to order what's left. The 6-inch, one-of-a-kind, $200-$666 Mythic Legion figures displayed at New York's Four Horsemen show last February are now up for grabs, including my favorite - Date Knight. Click here to see what's left at Store Horsemen - these may be the only Mythic Legions you get a crack at for a few months! Maxx Zero (blanks, regulars, and super-deluxe) pre-orders are up now - but they end Saturday at 11:00 PM Eastern time. Click here for the confirmation, or more importantly, click here to order one. A very Crayboth-heavy Onell Design Glyos Tracker's Way drop includes a Halloween themed figure or two, plus some vinyl and a nifty $12 Tracker Sarvos Conversion Set. Everything can be found here, so be ready on Sunday for the release. And of course, just in case the Internet swallowed the Onell Design post, I'm going to go ahead and post the stuff below for your amusement. After its debut at the Four Horsemen event in February, people have been asking "So when is this Mythic Legions thing happening?" MythicLegions.com is live right now with a page featuring 13 named characters - this is news! No release dates, pricing, or other specifics are known - but it's progress. I expect something in early 2015. As always, we'll throw up a notice somewhere as soon as any way to get these is announced somewhere. Get ready! 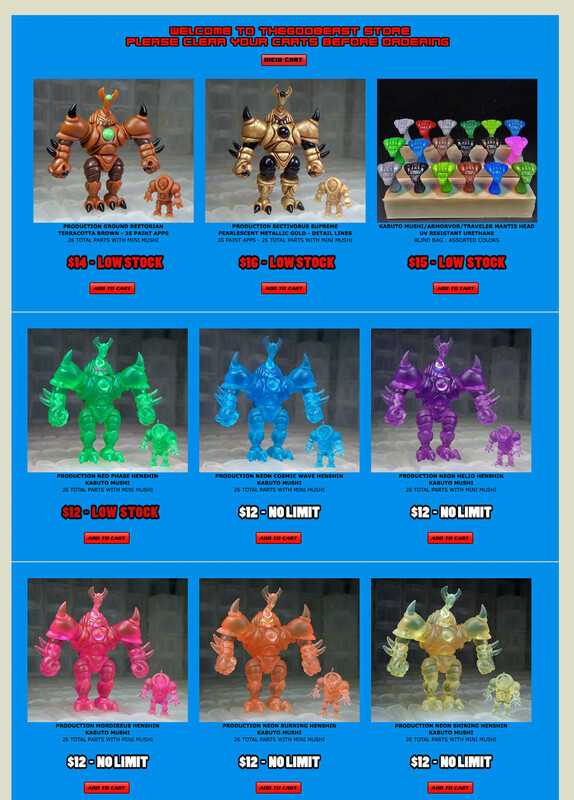 In a new post called "Tracker Type", Onell Design confirms that there will indeed be a new Glyos drop at 9:30 PM on Sunday, October 26 - just before Halloween! Promised: Halloweeny Crayboth. Also promised: the new Armorvor head isn't ready. Matt Doughty confirms that the cherry-like Sarvos is a nod to the very first Custom Corps release (and Matt Trakker of M.A.S.K. ), and I must say it does look swell. More soon! Don't miss it! If you like options, brother, Kent's got options for you. 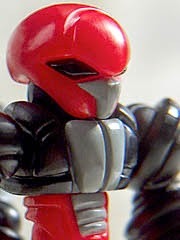 The long-awaited Robo Force Maxx Zero (the Steele-Forged Hero) is up for pre-order in three great flavors. Full mechanical drawings and specs are up for each edition. The unpainted version is $12. The standard version is $18. The Ultimate version has full detail lines with over 100 paint applications, and is $35. Click here to pre-order yours now for an ETA of December 2014. No deadline was listed. 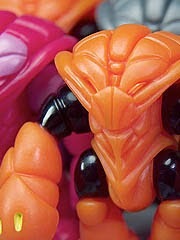 Attention news-starved Robo Force fans - ToyFinity posted art of THE ORIGINAL STEELE-FORGED HERO! 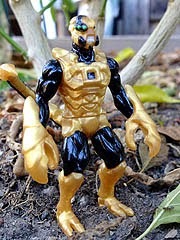 The Basic Maxx Zero looks a whole heck of a lot like a great update of the original Maxx Steel from the 1980s, and I can only hope this means he'll be up for grabs in the ToyFinity store soon. It's green! The Mordles Night Mordle Vinyl Figure brings you elements of two of Hasbro's bigger 1980s properties, and applies them to Mordles. You get the "cutie mark" (nee Tramp Stamp) of My Little Pony with colors and themes reminiscent of the 1980s G.I. Joe Night Force figures of 1988-1999. As a series of repaints, those two toy lines are a perfect fit for this, the fifth big vinyl 4-inch Mordle. In case you missed it: October 5, 2014 TheGodBeast Menu. Two new figures, several custom heads, and some still-available classics. Of note, the new Ground Beetorian and Sectivorus Supreme figures. Click here to order - they're still in stock!